New York As President Obama's second term in office hits the home stretch, he returns to his legacy issue -- nuclear non-proliferation. 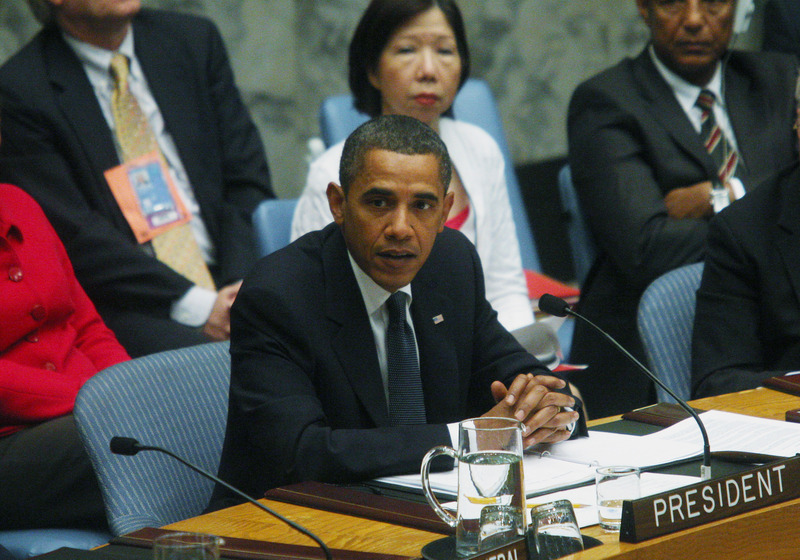 Nine months after his January 2009 inauguration, President Obama made his first visit as president to the United Nations -- the first time an American president chaired a meeting of the Security Council -- and unanimously passed a resolution reaffirming the world leaders' goal of a world without nuclear weapons. He called on the five permanent members of the Security Council -- all of them nuclear powers -- to reduce nuclear weapons and to prevent weapons from falling into the hands of terrorists. U.N. Resolution 1887, which the U.S. negotiated and President Obama raised his hand to pass in 2009, called on all states to disrupt illicit trafficking in nuclear materials, to closely monitor the proliferation of nuclear weapons and to prevent their delivery to non-state actors. Later in his first term in office, Mr. Obama sealed an agreement with Russia on the new START treaty to limit Russian and American stockpiles of nuclear weapons to 1,500. Now, President Obama is looking to keep the goals of the Nuclear Non-proliferation Treaty of the 1960's in place at a time when North Korea is brandishing its nuclear weapons, and Iran is moving forward on development of nuclear technology. Stalled because of tensions with Russia and difficulties of getting any effort on non-proliferation passed in the U.S. Congress, President Obama is looking to reduce the number of weapons by nuclear nations, including the U.S., and to persuade Congress to pass a nuclear test ban treaty. With the historic Brandenburg Gate as the backdrop, President Obama is seeking to tell the world that the U.S. will maintain a credible deterrent but reduce the stockpiles, hoping that his legacy issue of non-proliferation, endorsed in the past by John F. Kennedy (50 years ago) and Ronald Reagan (in 1984 at Fudan University in Shanghai, China) can carry the day.